Canada is a relatively new comer in the competitive bullion gold coin market and in 1979 entered the Canadian maple leaf gold coin into collector competition. This entry was the first pure gold bullion coin of its kind and quickly gathered the interest of collectors. Canadian gold bullion coins are highly popular on today’s gold market and are nearing the trading value of the South African Krugerrand. The Canadian maple leaf gold coin is sculpted in gorgeous maple leaf symbolism on one side and features Queen Elizabeth II in profile on the flip side. There are also special editions that are available and popular with coin collectors on the worldwide market. The actual gold content these coins is 1.0 troy ounce or 31.103 grams and coins are minted with a face value of $1, $5, $10, $20 or $50. It is interesting to note that the Canadian maple leaf gold coin was originally minted at .999 purity, but in 1982 the Royal Canadian Mint changed the classification to .9999 pure gold coin and these coins are minted with relatively no base metals. With this classification change each Canadian maple leaf gold bullion coin can be used as legal tender and this status allows Canadian gold bullion coins to be used as debt settlement tools. 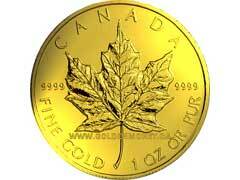 Canadian maple leaf gold coins exploded in value during the credit and financial crisis in 2008. That was the year that the Royal Canadian Mint reported a major increase in Canadian gold bullion coin sales. This leap in sales represented a cumulative 617,400 ounce from previous sales statistics. Canadian government officials reported that their Winnipeg mint was capable of handling this jump and with this increase the sales of these Canadian gold coins remained constant during 2009. Even though the sales of Canadian maple leaf gold coins remain constant, there are flaws in the coins themselves. Collectors have reported that the lack of hardening metals make these .9999 gold coins are extremely soft. Excessive handling will create imperfections and pitting in the coins. This may not seem to be a big problem, but collectors dislike these imperfections which drastically reduce the value of the coins.